These are wonderful to make for a stay at home pizza night, or when you want a little snack. These are easy to make, and you can save money by making these at home. 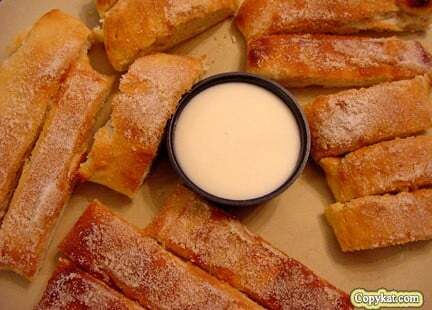 Don't miss out on these Dominos Cinnastix. Preheat oven to 350 degrees. Roll out pizza dough to a rectangle, roughly 10 by 12 inches, cut in half across the longest side, and then cut the other sides into 8th's. You should have 16 individual pieces now. Place pieces onto a lightly greased baking sheet, and bake for approximately 15 minutes. While the sticks are baking, make the icing by combining the powdered sugar, vanilla, milk, and 1 tablespoon of butter. You may need to add additional milk to thin down the icing. Set icing aside. Combine the 1/2 cup sugar and 2 teaspoons cinnamon in a bowl, mix well. Melt the 1/4 cup butter and when the pizza dough is done brush with butter. Sprinkle over the cinnamon and sugar mixture over the freshly buttered sticks. Enjoy. I have to say these were really good. The use of real butter adds something. I also worked at Domino’s Pizza and was around when these things first came out. They used a bottled subtance called Whirl….not butter, but it sure smelled like movie popcorn butter. Thanks for the info to make them at home. Some places use butter but others do not. I would like to make apple dumplings –like Furr’s Cafeteria makes! Please help!